Grenada gained independence on 7 February 1974, and the charismatic, autocratic, Sir Eric Gairy became Prime Minister. A coalition of several opposition Socialist groups formed the New Jewel Movement (NJM) with Maurice Bishop, popular with the people, and Bernard Coard, adept at operating behind the scenes, as its leaders. The New Jewel Movement, however, could do little to remove the highly popular, though erratic, Gairy until 14 March 1979. On that day, while Gairy attempted to persuade the U.N. Secretary General to establish a commission on unidentified flying objects, the NJM staged a bloodless coup and made Bishop Prime Minister; with Coard his deputy. Although the NJM started a program to rebuild Grenada's economy, its leaders concentrated on the perceived threat of invasion by pro-Gairy supporters in the United States. This, coupled with their predilection for Marxist Leninist theory, made Grenada a Soviet backed country. Although united on the invasion threat, the Bishop and Coard factions drifted apart over Marxist Leninist philosophy. The Coard group perceived Bishop as a power hungry hindrance to the NJM's ultimate goal of transforming Grenada into a miniature Cuba. Furthermore, they believed that he was not sufficiently aggressive and determined in supporting the NJM and their revolution. On 13 October 1983, the Coard faction placed Bishop under house arrest. Six days later, Bishop's supporters marched to his house, pushed past the guards, freed Bishop, and carried him to Fort Rupert, headquarters of the People's Revolutionary Armed Forces (PRAF). Once there, they dispersed the garrison. Three Soviet made BTR-60 armored personnel carriers manned by soldiers of the PRAF left Fort Frederick and headed for Fort Rupert, where the soldiers opened fire on the demonstrators, seized Bishop and his principal supporters inside the fort, and executed them. Defense and Interior Minister General Hudson Austin announced assumption of power by a military council, including himself and other PRAF officers, with a shoot-on-sight curfew in effect. Meantime Coard disappeared. tions. The OECS, believing that the successful leftist military coup in Grenada might encourage leftist revolutionaries in their own countries to take similar antigovernment action, unanimously agreed to ask President Reagan to intervene with military force in Grenada. Barbados and Jamaica, non-OECS members, also asked for United States military action. President Reagan, concerned lest another Teheran type of hostage situation occur because of the presence of American medical students on the island, also viewed the bloody coup and the possibility of leftist foment in the region of pro-U.S. democratic states with alarm. Since a hostile environment in Grenada might compel the United States to use considerable military force to safeguard and evacuate its nationals, the President ordered the joint Chiefs of Staff to determine American military options against Grenada. 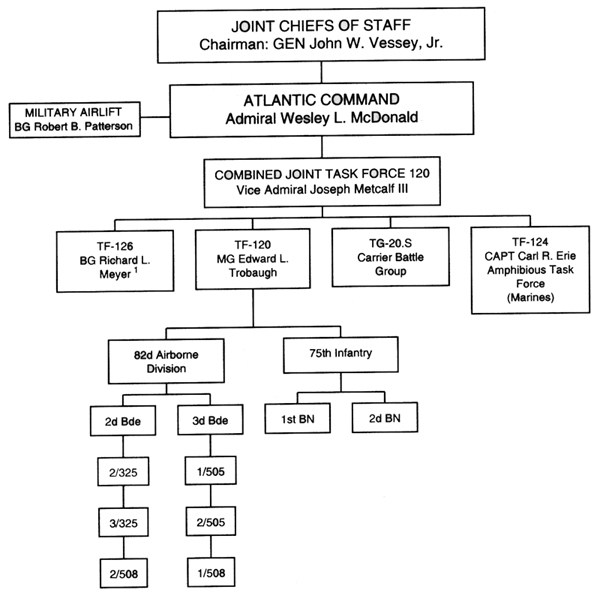 The JCS directed Admiral Wesley L. McDonald, Commander-in-Chief, Atlantic command, to develop options for evacuating American nationals, primarily the medical students, from Grenada. Admiral McDonald's staff decided on six options, one of which called for military intervention. After receiving a request for intervention from the OECS and noticing with apprehension the deteriorating and unstable situation in Grenada, on 22 October President Reagan ordered the JCS to prepare for a military intervention. 1 Tactical Air Suport Directly Subordinate to Atlantic Command. Approximately 0530 the next morning, marines from the 22d MAU conducted a heliborne assault on Pearls Airport, meeting light resistance. They quickly secured the area and other Marine elements landed in Grenville with no opposition. Farther south at 0535, two battalions of Army Rangers parachuted from 500 feet into the Salines runway through heavy antiaircraft and small arms fire. They rapidly secured and cleared the runway of the obstructions that Cubans and members of the PRAF had placed on it. The first C-130 with additional Ranger troops and equipment touched down just two hours after the 75th Infantry hit the runway. Simultaneously, members of the 1st Battalion secured the True Blue Campus with its medical students. Then, for the first time, the Rangers learned that the main medical school campus was at Grand Anse Beach. The rest of the 75th Infantry, after capturing the terminal area and control tower, by 1000 moved to the high ground that overlooked the runway and the Cuban compound at Calliste. The infantry did not fire on this compound because of the possibility that it contained noncombatants. The CPF arrived at Salines forty-five minutes later and shortly thereafter linked up with the Rangers. day's action Army troops held Salines Airport plus most of the surrounding high ground. The marines occupied Pearls Airport and Grenville as well as a beachhead at Grand Mal. During the night of 25 October and the early morning of the 26th, the senior commanders on Grenada, as well as those in the Pentagon, evaluated the operation. The opposition had been heavier than anticipated and Army progress accordingly slowed. Nor had all of the medical students been rescued. Although all SOF personnel and equipment had departed and the Rangers were awaiting transport back to the States according to the original plan, the evaluation determined that changes were needed. Therefore, the 75th Infantry was placed under the operational control of the 82d Airborne, and Secretary of Defense Caspar W. Weinberger authorized the latter to bring in four more airborne infantry battalions to reinforce the two already in place. At 0400 on 26 October, the marines advanced from Grand Mal to St. George's and secured the Governor-General's residence at 0710 and Fort Frederick at 1615. Meanwhile, the Cuban compound surrended at 0700 after another heavy exchange of gunfire. Elements of the 82d Airborne reached the military warehouses at Frequente by 1400 and established defensive positions. At 1100, Metcalf ordered Maj. Gen. Edward L. Trobaugh, Commanding General of the 82d Airborne Division, to rescue the students at Grand Anse Beach. Trobaugh decided that the Rangers, with more experience in heliborne assaults, would effect the rescue. Because the 82d aviation assets had not yet arrived, the 22d MAU supplied CH--46 helicopters to deliver and pick up the Rangers and CH-53 helicopters to evacuate the students. A-7 Corsairs from the U.S.S. Independence and an Air Force AC-130 provided air support. At 1615, this task force assaulted the medical school area and under intermittently heavy fire removed the students without casualties. The entire operation, from first landing after the fire preparation to the last departure, took only twenty-six minutes. That afternoon the first C-141s took off with student evacuees for the United States. At 0700 the next morning, the 82d Combat Aviation Battalion (CAB) arrived at Salines to provide the infantry with their own air assault helicopters (UH-60s). An hour later, the marines seized Richmond Hill Prison and began clearing St. George's. The 82d Airborne Division received additional troops that morning and moved farther toward St. George's, drawing only scattered fire. At noon, Atlantic Command informed Metcalf that the JCS wanted Calivigny captured by nightfall. Twenty minutes later, Trobaugh received orders to assault the training camp located there and directed the 2d Battalion, 75th Infantry, to conduct the operation. After one-half hour of preparatory fire, at 1645 the Rangers assaulted Calivigny in Army UH-60s and quickly secured the area. them. The Rangers departed Calivigny at 1400 and returned to Salines, where they assembled with other members of the 75th and returned to the United States. Meanwhile, the CPF arrived at Queen's Park Race-course north of St. George's to guard prisoners captured by the marines. On 29 October, Trobaugh and Maj. Gen. H. Norman Schwarzkopf, Deputy Commander of CJTF 120, discussed a captured Grenadian military map that identified arms caches in the southern part of the island. They agreed to establish a task force at 1500 to search for and recover the arms and ammunition. Task Force Newman, composed of the scout platoon and an infantry platoon from the 2d Battalion, 508th Infantry, and the scout platoon from the 3d Battalion, 325th Infantry, set out in gun jeeps and civilian dump trucks. During a nearly twenty-seven hour operation, Task Force Newman discovered and brought back to Salines substantial quantities of Soviet-manufactured weapons and ammunition. On 30 October, the marines began securing other major population centers on the island, clearing Sauteurs by 0915, Gouyave at 1745, and Victoria at nightfall. In the morning, the 1st Battalion, 505th Infantry, cleared the Calivigny peninsula, and the 3d Brigade, 82d Airborne, secured the adjacent Fort Jeudy peninsula at 1400. The next morning the 2d Battalion, 325th Infantry, landed at Grand Etang and swept the deserted training area. That afternoon, Trobaugh assumed responsibility for St. George's, and, eight hours later, the 22d MAU's ground units returned to their ships. At 0530 on 1 November, these Marine elements conducted an amphibious and heliborne assault on Carriacou Island north of Grenada. They were relieved by members of the 2d Battalion, 505th Infantry, the following morning. At 1500 on the same day Metcalf declared hostilities at an end and the 22d MAU resumed its interrupted voyage to the Middle East. On 3 November at 1000, McDonald dissolved CJTF 120 and named Trobaugh Commander, U.S. Forces, Grenada. Later that evening the Atlantic Command informed him that the Cubans would be repatriated, beginning on the following day. Overall, Operation URGENT FURY was a success. American forces, primarily from the Army, defeated opposing forces, evacuated the medical students and other U.S. nationals, and opened the door to a reinstitution of democratic government. Members of Combined Joint Task Force 120 killed 45 soldiers of the PRAF and wounded another 337, capturing 146. The remaining PRAF soldiers discarded their weapons and uniforms and merged with the general population. American forces also killed 24 Cubans, wounded 29, and captured 600. American losses during the operation were 19 killed and 113 wounded in action. Furthermore, the task force evacuated 662 U.S. and 82 foreign nationals from the island. The Armed Services accomplished their mission with minimal damage to Grenada and few civilian casualties. Immediately after the intervention, 500 Army engineers arrived in Grenada to repair buildings, roads, schools, and hospitals as a part of the island's rebuilding process. A three-member team from the U.S. Army Corps of Engineers' Mobile District traveled to Grenada during November and December to determine the amount of compensation due Grenadians whose property was used or damaged by U.S. forces during the subsequent occupation. Various Army Reserve units also performed humanitarian missions for Grenadians, such as collecting and distributing books to the country's schools. held in December 1984. The people of Grenada elected Herbert Blaize Prime Minister and gave his party fourteen of the fifteen seats in the country's House of Representatives. Blaize requested that American troops remain on the island, but the last peacekeeping unit left on 11 June 1985. A thirty-man Special Forces detachment did remain behind to provide military training to Grenadian forces. Operation URGENT FURY demonstrated the Army, Air Force, Navy, and Marine Corps' ability to execute a joint contingency operation on short notice with minimal planning time. Although problems in coordination, communication, and interservice doctrine did arise, most were wholly or partially solved on the ground, once again demonstrating the American soldier's ingenuity and flexibility. Furthermore, the Army employed in combat several new additions to their inventory, such as the UH-60 Black Hawk helicopter, REMBASS, and the kevlar helmet. All performed superbly under combat conditions. Operation URGENT FURY proved that the Army's new training philosophy, "train as you will fight," worked.